Sophie and I made a really nice meeting in Sam Neua, northern Laos. We met Mr. Daoheuang PHETPASEUTH and Ms. Maikham SOUKHATHAMMAVONG, respectively Director and director assistant of Sam Neua SOS Children’s Village. Just arrived in Sam Neua, coming from the Vietnamese border, we called them and they first came to our guesthouse to welcome us. We set an appointment for the next day. 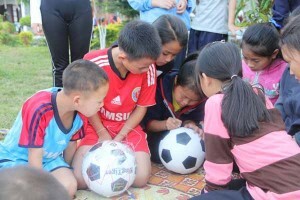 Sam Neua SOS Children’s Village is a couple of kilometres far from the centre of the city. The road is nice for cycling, through the countryside. 200m before Sam Neua SOS Children’s Village entry, we saw from the road a « SOS » made of small plants. No risk to miss the Village! 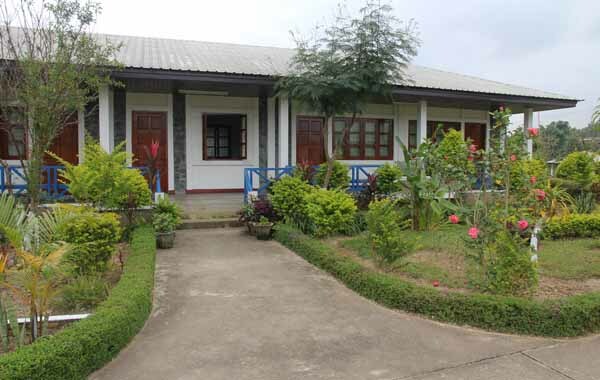 Arriving in Sam Neua SOS Children’s Village, we immediately felt the peaceful atmosphere of the place. The buildings are bright and good-looking, surrounded by plants. Mr. Daoheuang PHETPASEUTH and Ms. Maikham SOUKHATHAMMAVONG welcome us and they gave us some information about the Village. 2005: beginning of the activities. Mr. Daoheuang is the 1st director. Before, he was a civil engineer. 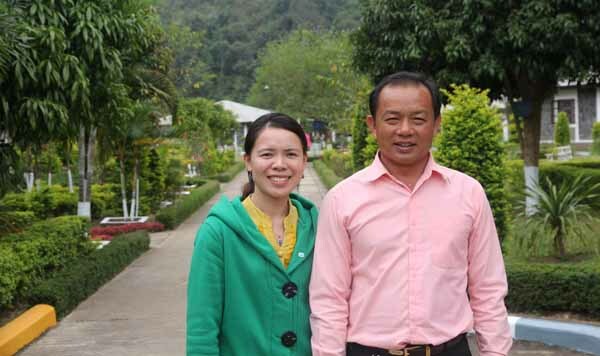 His wife is a doctor in Sam Neua. Sam Neua is the capital of the province of Houa Phanh, one of the poorest of Laos, located northern east from Laos. Per capita income of the province’s 300,000 inhabitants is about one third of that of the whole country. In many places, one can still see the destruction caused by decades of war with France and the U.S. Due to a lack of government resources, there are hardly any facilities for the support of children in need. 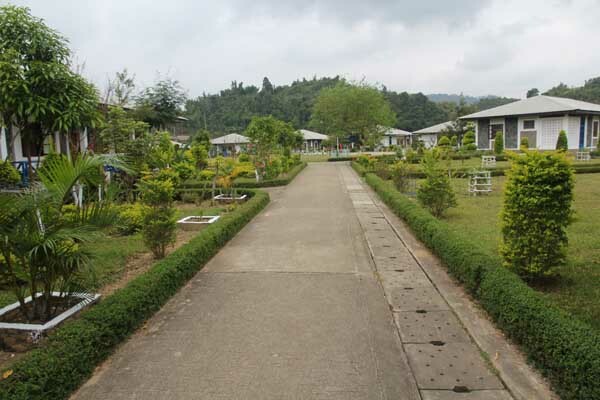 The SOS Children’s Village is composed of 10 houses where live in each 10 children with their SOS Mother. The SOS Children’s Village has a malnutrition centre also, which is very special. 2 houses are dedicated to this centre. 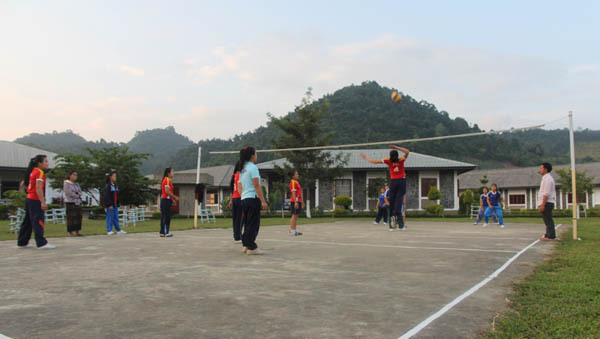 The 12 houses are spread around a nice sport field, with volley ball, football, badminton and petanque (very popular in Laos!) pitches. Concerning education, there is a day-care centre for the children under 3 years old, a kindergarten, a primary, a secondary and a high school. 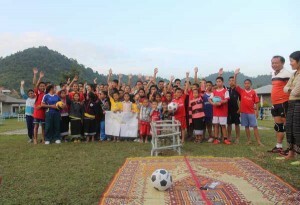 The schools are open to the children and the youths from the neighbourhood. The youths from the SOS Children’s Village who come over 14 years old are hosted in a youth centre 1km far from the SOS Children’s Village, going to city centre. An administration building, a house for the director and a medical centre (with a doctor and 2 nurses) are also in the SOS Children’s Village. 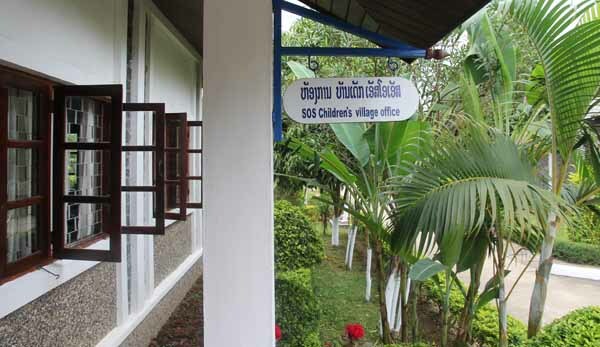 The SOS Children’s Village hosts currently 94 children. 13 SOS antes help the 10 SOS Mothers and take care about the children from the malnutrition centre. The board of the SOS Children’s Village is told by the surrounding villages or the committees that some children are in the need of a care. Then the director goes to the village, meet the people concerned and decide if the children can be welcome by another member of their family or if they come to the SOS Children’s Village. As far as the malnutrition centre is concerned, the conditions of arrival are quite the same. The director visit the villages in the neighbourhood, and proposes to families to take care about one or several child(ren) who seems suffer of malnutrition. The children stay 4 or 6 months in the malnutrition centre and are brought back to their families. 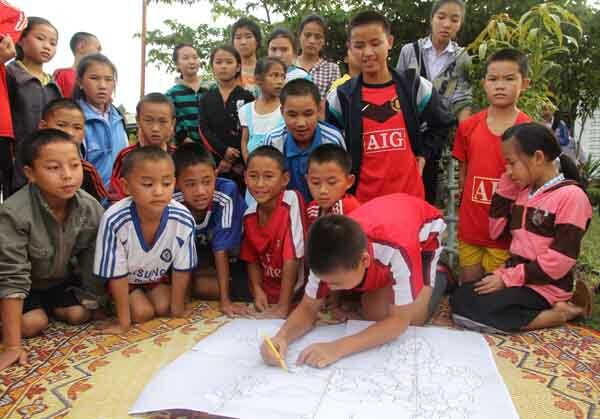 Currently, 27 children are in the care of the centre, where 4 ants work full-time. 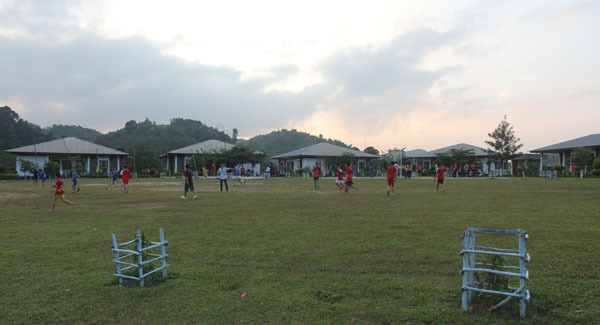 Some sport competitions are held with other schools in the province. There is no link for children with other SOS Children’s Villages due to the distances between them. SOS Mothers in Vietnam have chosen to dedicate their whole life to children in the care of SOS Children’s Villages. They are single, over 25 years old and spend almost all the time with children, 7 days a week, 24 hours a day. However, if needed, they can take a couple of days off every month. Before being graduated as SOS Mothers, they got a 6 months training and then 2 years of probation. Their close relatives can come to visit them 3 times a year in the SOS Children’s Village. 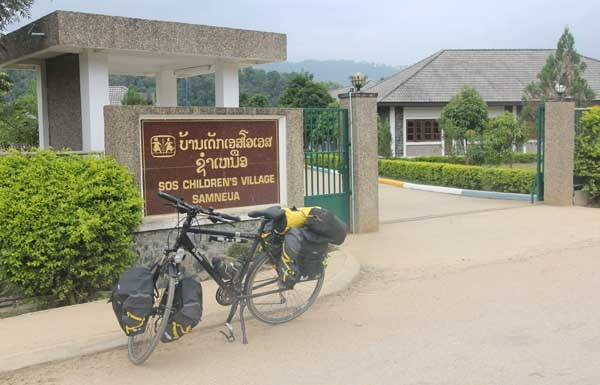 Funds of Sam Neua SOS Children’s Village come from the SOS Children’s Villages headquarter which centralizes and distributes the money collected all over the world. 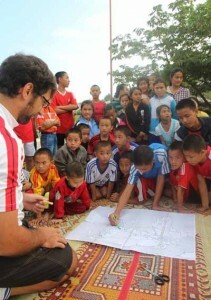 The Village receives also supports by private donators and some children are sponsored by donators. 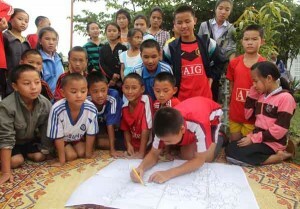 How can Sam Neua SOS Children’s Village be helped? Any kind of help is welcome: material support, donations, stationary… Do not hesitate to contact the Sam Neua SOS Children’s Village by email daoheuang.soscvsn@etllao.com, or to visit the SOS Children’s Villages International website http://www.sos-childrensvillages.org. You can also donate to SOS Children’s Villages France via the fund raising promoted by Roule au Printemps. After the meeting, it’s lunch time and we let our hosts have lunch and work. We came back to the Village at 4pm, after school. 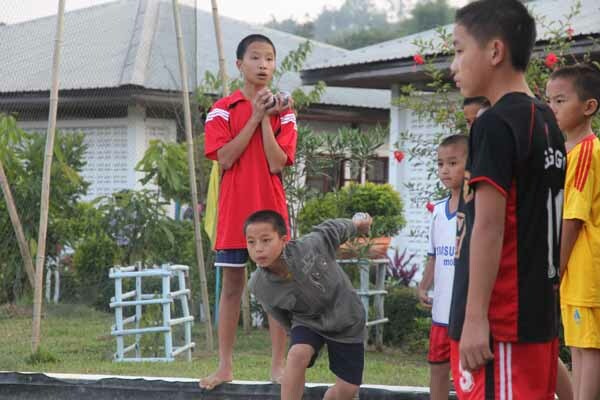 Almost all the children and members of the staff were on the sports field, playing volleyball or football or petanque… The sun was shining, everybody seemed happy, the atmosphere was very joyful. We also gave 1 football ball to the children and ask them to sign another one that we will give to the children in the care of Nong Khai SOS Children’s Village in Thailand. 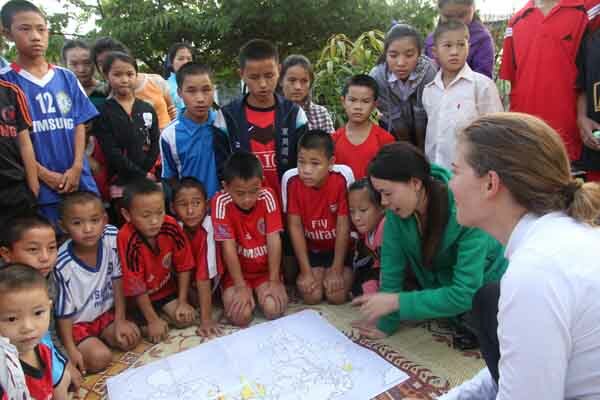 We spent a delightful moment with the children and the staff, and we realized how useful the association is for the province of Houa Phanh.